Bring a pot of salted water to a low boil. Prepare an ice bath with ice cubes and cold water. Blanch the tomatoes for approx. 20 - 30 sec. in the pot then transfer and submerge them in the ice bath. Remove the skin. Heat olive oil in a pot set over medium-high heat. Finely chop garlic and onion and add to the pot with the cane sugar. Stir thoroughly. Add tomato paste and deglaze with apple cider vinegar. Allow to simmer and reduce by half. Cut the tomatoes lengthwise into slices, add to the pot, and mix thoroughly. Add cinnamon stick and chili flakes. Place mustard seeds and allspice in a tea egg and add to the pot. Season with salt and pepper and let sauce simmer until reduced by half. Remove cinnamon stick and tea egg. Purée with an immersion blender and strain through a sieve into a large bowl. Allow to cool for approx. 30 min. 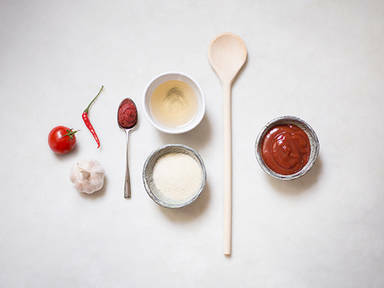 Store ketchup in an airtight container in the fridge for up to 2 weeks. Enjoy!